Who’s The Fastest of Them All? Long, long ago somewhere in Africa… When the earth and all the people and animals were new… The Creator of all things decided to find out which of His animals was the swiftest of them all. To this end, He devised a plan for Cheetah and Tsessebe to race against each other because, in Africa, Tsessebe was the fastest of all the antelope. In those long-ago days, Cheetah had very soft paws and he realized that they were not suited for genuine speed or long distances. To help his friend, Wild Dog, offered to lend him some paws to use for the race. The race started from the base of a huge baobab tree on the side of a big plain dotted with thorn trees. The two contestants would cross the plain, as fast as they could, to the hill on the far side. With the Creator Himself presiding, Tsessebe and Cheetah lined up, and then at the signal, they bounded away. Tsessebe… You lookin’ at me? If you Were this Ugly, Wouldn’t You Want to be Fast Too? Ugly maybe, but very fast, Tsessebe soon drew to the front. To the assembled animals, he was so far ahead it appeared he would surely win. But suddenly in a cloud of dust, the speeding antelope disappeared! 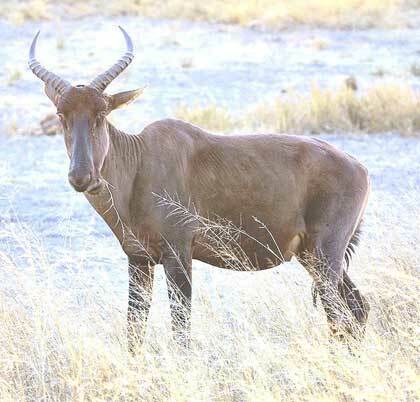 Tsessebe had stumbled on a stone and crashed to the ground with an injured leg. Softhearted Cheetah could not leave his rival lying in the dust like that. Instead of running past and winning the race, he stopped to help his competitor. 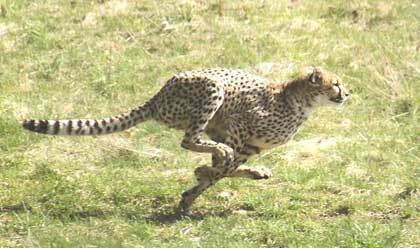 The Creator, witnessing this, was so moved by Cheetah’s noble act that He bestowed upon Cheetah a legacy, making him the fastest animal on all the earth. To equip Cheetah for his new gift, the Creator made for him paws, just like those he had borrowed from his friend, Wild Dog.